Navy top brass and politicians have attended a ceremony in Scotland to commemorate the loss of a legendary Russian ship. A bronze cross was unveiled on the coast of the Firth of Clyde to mark the spot where the warship Varyag ran aground more than 80 years ago. In Russia, the cruiser has a celebrated military history going back to Russia's war with Japan in 1904. Former Nato Secretary General George Robertson attended the event. He was joined by British and Russian navy officers and diplomats. At the start of Russia's war with Japan in 1904, the cruiser was trapped by a squadron of more than a dozen enemy ships. She tried to fight her way out, suffering horrendous casualties and damage, with the captain refusing to surrender and eventually scuttling his own ship. The Varyag was salvaged by the Japanese and ended up in British hands after World War I. 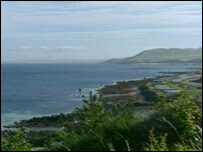 She was lost again when she hit rocks off the Ayrshire coast in 1920. During the unveiling ceremony at Lendalfoot, South Ayrshire, wreaths were dropped in the waters where the ship still lies. In 2006, a memorial tablet in memory of the Varyag was placed at the site, but the Russian people wanted to have a more significant memorial. 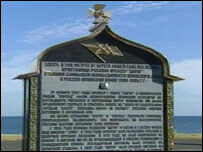 The unveiling and dedication of the memorial was broadcast live across Russia.